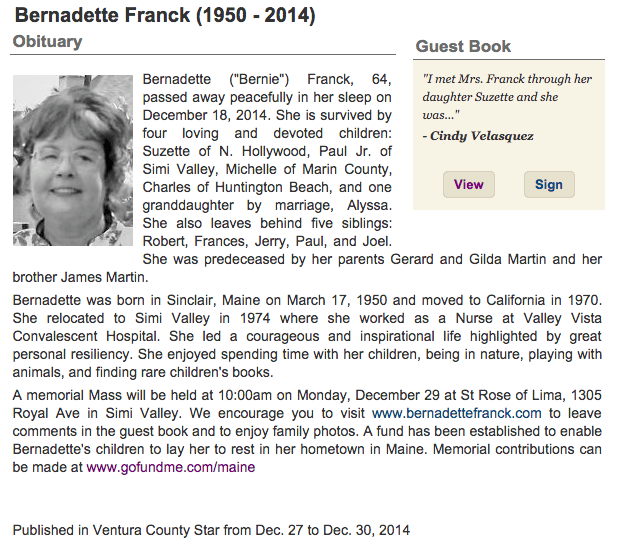 Below is the obituary that we had posted in the local paper of Simi Valley, the Ventura County Star. It will be available for short time on their website, but I have screen captured it below as a memento for this website. Please do not sign the guestbook on the Ventura County Star because it will be taken down in a month, so please sign the guestbook on this website at http://bernadettefranck.com/guest-book if you have not done so already. You can also upload pictures here, or email Suzette if any issues with the website. We really appreciate all the prayers and nice condolences for my mom. Thank you everyone for all of the support during this difficult time. Next Next post: Happy Birthday, Mom!